A custom script is the script used by an Execute Script command to execute custom functionality. 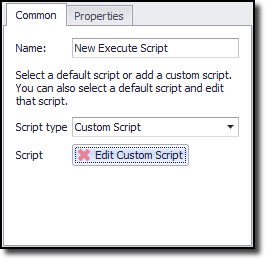 The Execute Script command provides a list of predefined scripts that can be used directly or edited to suit specific needs. Please see the Execute Script topic for more information about how to use the predefined scripts. The above script uses the IConnection and ICommand interfaces which are part of Content Grabber's Script Utilities. The agent will retry the specific container command. The container command must be a parent of the current command. The agent will exit the specific container command. The container command must be a parent of the current command. The agent pauses and displays an agent web browser, which allows a user to interact with the web browser before continuing processing. The agent continues its normal executing flow.